For the second year in a row, Fred’s Pharmacy in Loretto has partnered with the School Nurses of Lawrence County. 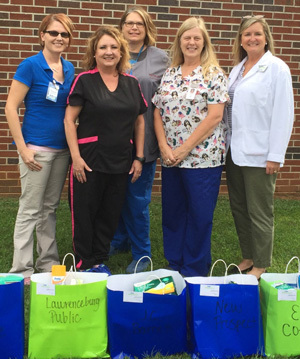 Fred’s Pharmacy recognizes the importance of these school nurses and hopes to partner with them to benefit all the students of Lawrence County. School nurses operate on a strict budget that always falls short of the school year and Fred’s Pharmacy saw this as an opportunity to share in this burden. Donations were taken from the Fred's shoppers during back to school season. These donations included bandages, gauze, hygiene products, peppermints, Lysol, contact solution and cases, epinephrine storage containers, gloves, cotton balls, Q-tips, and more. All of the 13 school nurses received a bag of donated supplies. The donations totaled $540.00. Fred's Pharmacy would like to that the generous shoppers that made this possible and our wonderful school nurses who care daily for the students of this county.